Plant a tree in memory of Mattie "Ruth"
Be the first to share your favorite memory, photo or story of Mattie "Ruth". This memorial page is dedicated for family, friends and future generations to celebrate the life of their loved one. Mattie “Ruth” Wilkie Russell, 86, wife of Lloyd “Rusty” Russell of Bonview Rd., entered into rest Friday February 2, 2018. Funeral Services will be held Monday February 5, 2018 at 2 PM at Parksville Baptist Church with burial in the church cemetery. The family will receive friends from 1 to 2 PM before the service in the Fellowship Hall. Mrs. Russell was born in Laurens County, SC and was co-owner of Rusty’s in Clarks Hill. She was a member of Parksville Baptist Church. Survivors include her husband, 1 son, Wayne Russell; 1 daughter, Cheyanne Whitehead; 1 sister-in-law, Betty Dorn; 1 brother-in-law, Curtis “Buck” Daniel; 2 adopted grandchildren Jamie and Clifford Sanders; and numerous nieces and nephews. Memorials may be made to Parksville Baptist Church PO Box 4838, Parksville, SC 29844 or to a Charity of One’s Choice. 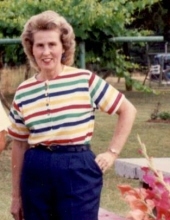 To plant a tree in memory of Mattie "Ruth" Wilkie Russell, please visit our Tribute Store. Family will receive friends from 1:00-2:00 PM in the Church Fellowship Hall. "Email Address" would like to share the life celebration of Mattie "Ruth" Wilkie Russell. Click on the "link" to go to share a favorite memory or leave a condolence message for the family.